What is the difference between the new BigShot ABY and the original? The only differences between the original (legacy version) and new BigShot ABY are aesthetics and the addition of the LEDs for visual feedback. You can operate the new BigShot ABY with or without a 9V Boss-Style adapter, the power is only used to illuminate the LEDs. No. We wanted to make the BigShot ABY easy to use, compact and affordable, and since most players that need LEDs to manage their setups also have power bricks, we felt the added cost of a battery compartment was not needed. Can I use the tuner output to run a third amp? Yes! Do note, this output is always active so you will not be able to turn it off from the BigShot. 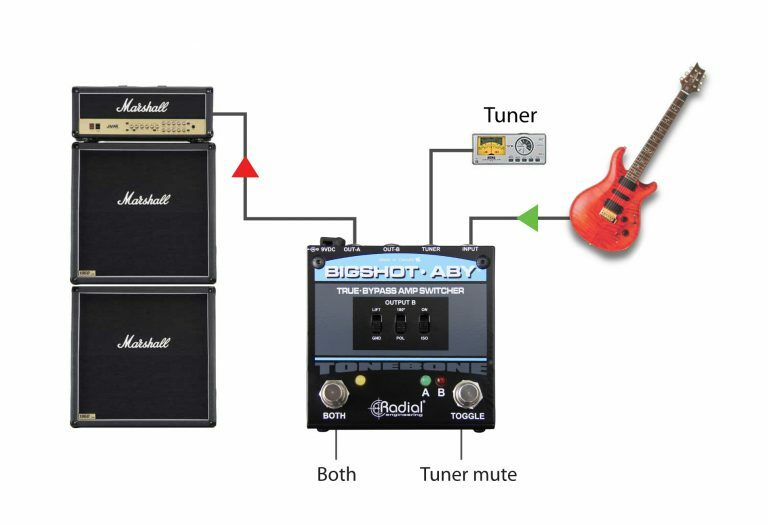 Should you decide to run a third amp with the BigShot ABY, ensure that you power all of your amps on one electrical circuit to avoid nasty ground loops. Can I use the ABY backwards as an instrument selector? Yes! Just make sure the isolation transformer is turned off as it will load down your signal. 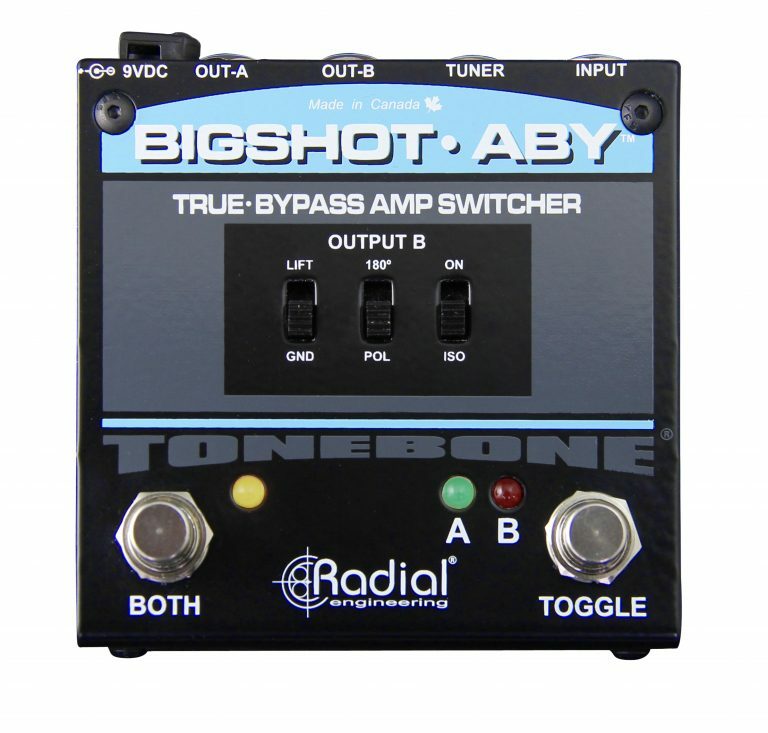 The ideal solution is to use the BigShot i/o™ instrument selector. Can I use the BigShot ABY to switch between two channels on an amp? Yes! 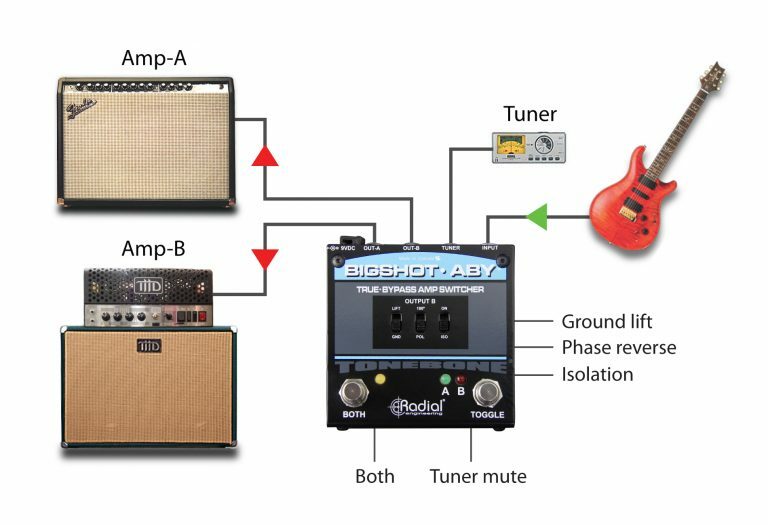 Many older vintage amps have two channels but switching between them is not possible. Simply connect the ABY as you normally would and send each output to a channel. The isolation transformer and 180° polarity reverse can be used to make sure both channels play in phase. 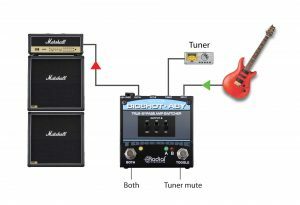 Will adding a tuner affect my tone? It can, however, this depends on the tuner. Many tuners will draw some current and therefore can add a minute load on your pickups. The result of this loading can change your tone slightly. 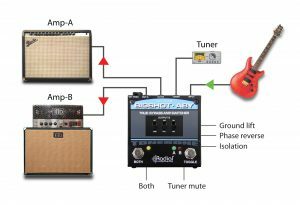 Will switching the transformer into the circuit change the tone? The isolation transformer may load down your signal resulting in a slight change to your original tone. The way to get around this is to place a high-quality buffer like the Elevator™ before the BigShot ABY. Does the BigShot ABY pop when switching channels? 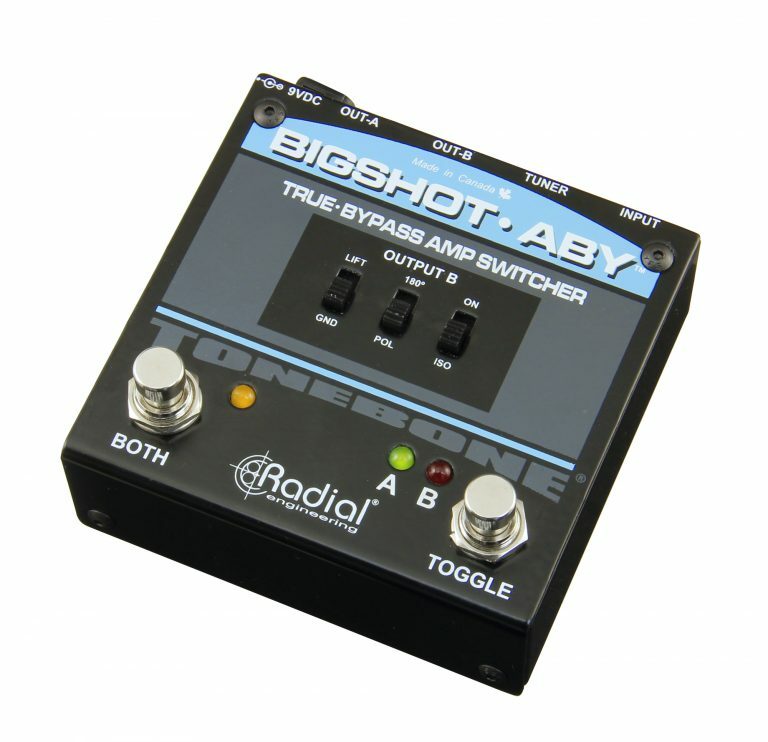 Because the BigShot ABY is a true-bypass pedal there is potential for popping. If you want to eliminate any chance for pops, you may want to consider one of our active ABY switchers like the Twin-City™ or the Switchbone V2™. 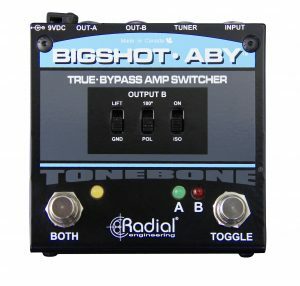 Can I use the BigShot ABY to switch guitar amps or cabinets? No. The BigShot ABY is not designed to handle speaker-level signals. We have the Headbone™ for switching between two amp heads and the Cabbone™ for switching between two speaker cabinets. 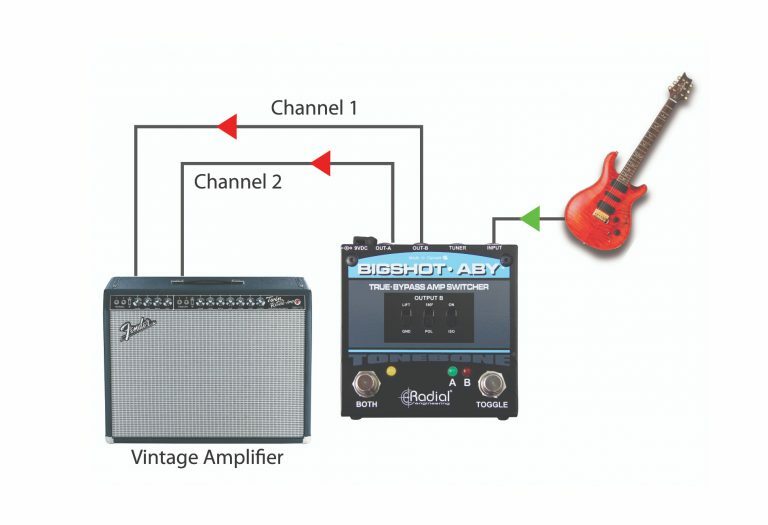 Can two people play guitar at the same time using the Big-Shot ABY in reverse through one amp channel? Yes, however, as there are no buffers to manage the two guitar signals, they will interact when one of the guitar volumes is turned up or down. 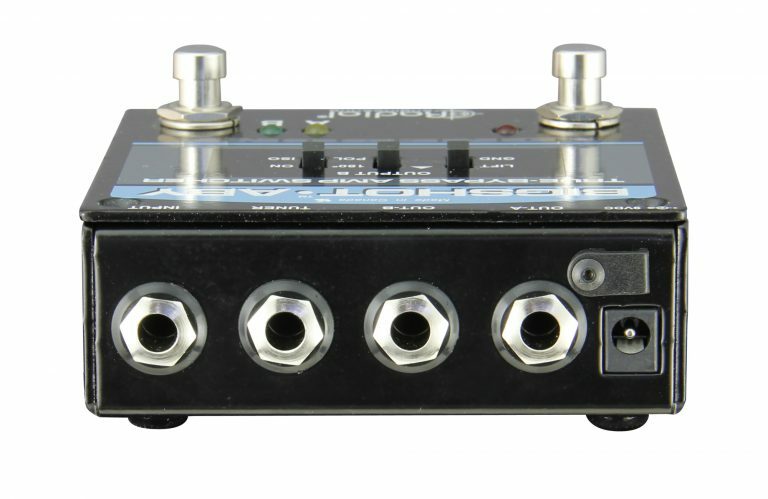 The Mix-Blender™ is a pedal that was designed to allow you to connect two guitars to one amplifier.